I was having lunch today afternoon ,Suddenly i received a phone from one of my friend Hemang [from Rajasthan] Who saw Athadu.He told me "Dude one of the heroes in Athadu is here in shipra mall".I asked him "Is it Mahesh or Sonu sood?? ".He replied its not Sonu.Immediately I rushed to Ram's room and both of we left for Shipra mall just a few metres away opposite my university on bike. No crowds there as people dont know the hero.All the telugu'ites there are from my college only. 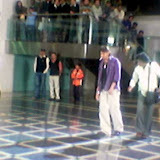 I was seeing for Mahesh there and to my surprise he was standing just beside us like other normal people.Dressed up in violet jacket and white cargo, Mahesh babu is slim this time and looking better than pokiri.he showed no signs of herogiri like other fundoo heroes like getting irritated on people.I went to Mahesh,introduced myself and asked him about the movie.Everyone on the sets is saying others not to fear"Just go and talk,sir is very friendly".Mahesh was replying everyone softly and speaking in a very elegant way.Hats off to him.His brother Ramesh babu is also accompanying him.Then Mahesh went for the shot in which he has to walk after searching for lighter in his pocket.Amrita Rao is checking the stores and the mall in the mean time since her shot is the next one. After the first shot they shifted the location to the front of Barista.Then me and my friends went to Surender Reddy,introduced ourselves as Mahesh Fans and had a autograph from him.The second shot started and people assembled this time as they know Amrita Rao.She was also looking cool.The second shot is like both of them walking opposite each other with Mahesh having a cigarette.After that i left the spot.Surender Reddy confirmed that the movie is going to get released this April.After the second shot is ok everyone in the mall stormed towards the hero and heroine and took photographs.The photographs and the videos can be downloaded from here. Im sorry about the quality of the pics and video as i forgot to take the digicam in the rushing.But Mahesh Babu rocks at the end of the day with his impressive behaviour with people and looks.All the best for Atidhi.I have other pics and videos which ill upload later. మహేశ్ బాబును కలుసుకున్న సందర్భంగా శుభాకాంక్షలు. తెలుగులోకూడా చాలా మంది బ్లాగులు రాస్తున్నారు. http://koodali.org చూడండి.